The Catalan club later announced Messi, who has netted 84 goals for club and country in 2012, had bruised his left knee and, while he may miss Sunday’s match with Real Betis, he should be back to full fitness shortly. After the Betis match, Barcelona have just two more league matches this year – at home to Atletico Madrid and away to Real Valladolid. The assessment of his knee injury was good news for Messi, but bad news for Gerd Muller. Messi is chasing the German’s world record of 85 goals in a year, which has stood for four decades. Muller began his Bayern Munich career with the team outside of the German top flight and ended it as a three-time European Cup winner following a golden age for the club. 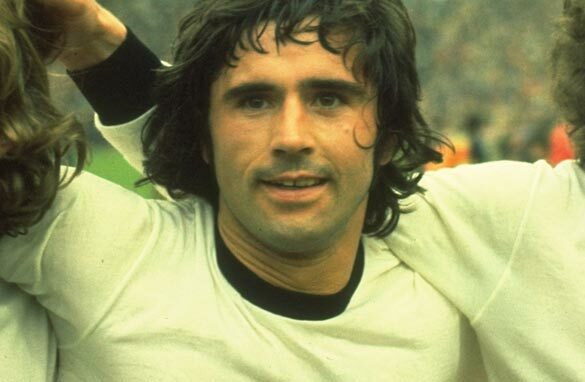 The unassuming goalscorer was a world champion with Germany in 1974 and also a Euro 1972 winner. The fearsome striker, nicknamed “Der Bomber”, played in a Germany team led by fellow Bayern great Franz “Der Kaiser” Beckenbauer, nicknames that hint at a society still affected by two World Wars. Muller and Beckenbauer helped usher in a bright new dawn for Bayern and an unprecedented level of dominance. The Bavarians won three successive German titles between 1972 and 1974 and were crowned champions of Europe in 1974, 1975 and 1976, with Muller’s goals the ammunition used to gun down opponents. “When I was a youngster and wasn’t sure what to do with the ball, I looked to get it to Gerd and he always managed to do something with it,” Muller’s former teammate and current Bayern president Uli Hoeness recently told the club’s official website. Muller scored 68 times in 62 matches for Germany, including the winner which secured his country the 1974 World Cup final against the Netherlands. For Bayern, he notched scored 365 goals in 427 Bundesliga fixtures - including 42 league goals in that landmark year. It is an extraordinary goalscoring record, even more so given the back pass rule was not in operation, the offside rule had yet to be amended, while referees arguably offered players less protection than they receive nowadays. While Messi has amassed his total largely thanks to slalom runs finished with chips and flicks, Muller plundered his tally as a poacher who operated inside the penalty box and finished with clinical precision. Although different in playing style, to the casual observer Messi and Muller have more than immense talent in common. Messi, who seems to reluctantly occupy the limelight, has been typically low key when asked about the record. Similarly CNN was informed by Bayern that Muller had decided a long time ago not to do any media work. "As I keep on saying, the record is not an obsession for me," Messi told a press conference. "I've heard my teammates saying they are going to help me beat the record, but all of the goals I've scored are down to their help. "I'm not worried about it. It would be very nice to do it because I am so close. If I do it I hope I can hold onto the record for as long as Muller but it doesn't worry me. "If I can do it, great, if I can't it's no big deal. But now I am so close I'm going to go for it." By contrast, Muller’s refusal to embrace celebrity could perhaps be explained by personal demons. In the early 1990s, after his playing career had come to an end with a spell in the now-defunct North American Soccer League, he battled to overcome alcohol problems. Rather than pursuing a career within football’s corridors of power like so many of his contemporaries, Muller works as an assistant coach for Bayern’s second team - which finished 12th in the German fourth tier last season. Unspectacular surroundings for someone named by FIFA as the greatest goalscorer of all time in 2000, but probably just the way Muller likes it. And you suspect that just as there will be no whooping and hollering from Messi if he successfully overhauls Muller’s 1972 tally, there won’t be any tears shed by the man who has silently stood unrivalled for 40 years. "arguably offered players less protection" there is no argument, up until the 1990s defenders would kick forwards to pieces, just look at the brutal treatment the likes of Gullit, Van Basten and Maradona received in their careers. Football today is almost a non contact sport. Messi has scored most of his goals in a league which is an affront to the term competition. The disparity between the top two and the rest should be investigated by the monopolies and merges commission. There is nothing impressive about scoring goals in La Liga. Messi, Ronaldo and Benzema struggle at international level for a reason, they're tactically limited nor can the cope with the increased pressure when they don't have a galaxy of stars or zealous home support, from fans and the media, to fall back on. Messi's record in major international tournaments i.e. the World Cup and Copa America stands at 3 goals in 18 games which is absolutely pathetic. Muller on the other hand top scored at a World Cup and European Championship and that particular record is one I doubt Messi will match let alone surpass. @mbmehdi – "tactically limited" a little harsh, but very good comment otherwise. Messi is a superb player but as the above comment by (mbmedhi) on the international field he doesn't compare to Gerd Muller. Playersshould be called "the greatest" with a little bit more reserve. Gerd Muller's record will be surpassed by Messi – let's remember different times / different game.While on the subject love to hear about a player scoring more world cup goals than any other (but it takes them 3 or 4 Word cup to achive) Let's remember Just Fontaine (France 1958 World Cup) 13 goals in one World cup and didn't even play in the finals (lost to Brazil in semi). Does anyone really believe Pele woul score a thousand goals in todays game Different times / different game. Muller may be a better goalscorer but only just and Messi is not supposed to be a striker anyway. Also I think it is a bit early to write off the international career of a man who at 25 is still 2 or 3 years off his peak. That being said, 'Der Bomber's goal tally is truly spectacular and given the positions they occupy on the field I could see both fitting in to the same team as each other with no negative effect on their goal output. They would be winning games scoring at average of 5 or more I think. How much would that front line have been worth? mbmehdi, your comments are very biased. How come La Liga is so poor and Spain sweep away everyone and win Euro and World Cup?? Mueller (and much more Pele) had great national teams already built around them, and Messi is not finished yet, he still has two, possibly three World Cups on the top level, so judging him too soon is too premature. Sure, he is ONLY the best top scorer in the champions league for the fourth time in a row. It´s not la liga it is an international competition!! By the way, spain right now (including national team) is the most competitive national league. Just loo at spanish teams results for the past 5 years. Also messi not only is the top scorer but also top assist in europe! and his dribbling skills are far better than muller! We'll see in 2014! Messi is an incredible and enjoyable player, but if he is better than Pele, Maradona, , Cruyff....Zidane ...I don't know .....in what area?, but compare him with Muller, sorry! there has been a lot of strikers in history, but complete players......like Messi just a few.......no comparison there! The way personally I compare a forward, is how many players he can deceive, with dribbling, beauty, and efficiency to finish a play...Messi is a creator not somebody waiting to finish a play with the mistake of others.....but Messi can do that as well.....sorry dude Der Bomber has been blowing away by a far better player ....! Muller should be happy that his record survived so many years....and being surpassed by a player like Messi! I did not watch much of Muller's games. Nevertheless, despite Mercy's brilliance, there is a delibrate media hype to make Mercy the world greatest without the statistics to support that role. Muller' record was not even known/popular untill Mercy started aiming at it. Mercy is quite a great player no doubt, just as there are many other great players that are not even noticed.Truely speaking, if you rate players by their achievements and statistics Mercy does not rank among the best 10 in the world. He has not yet achieved being mentioned amongst the world greatest when he had not shined at the world stage after 2 appearances. If not for bias, the world would have waited til he gets there before crowning him prematuredly. I am still strugling to understand why and how Sneijder and Ronaldho were robbed at different times against statistical achievements to crown Mercy World footballer of the year. On a pure stats level.. these facts that need to be once more reconfirmed.. Muller 85 goals in 60 games VS Messi 86 goals in 65 games.. Muller ZERO penalty goals VS. Messi 25 penalty goals..
One wonders: How many of those Penalties was Messi actually fouled and take his own penalty.. Conclusion: For me (If the above stats are true.. STILL MULLER.. !!! Messi Is the great player......................!!!!!!!!! Messi is the legend of football in ever. Messi deserved to be greatest world player ever because he reached the Gerd Mullerscoring tally re b/4 d end of d year. As a 52 years old fan of football, seeing Gerd Mueller often live, looking to the play of Messi I realy don't want to judge and there is no need to think who is better. Just take the numbers as they are, but don't start to assess the differences. Between Mueller and Messi are 40 years development of football and both play and score differently. Both are unique in successful goal getting. They score or scored from situations where nobody else can score – and so often in one year. I wish Messi to enjoy a world champion title, but he needs a team for it. Mueller was in a better enviroment with Franz Beckenbauer and others around or behind him, like the Rummenigge or the famous goal keeper Sepp Maier. If the readers of my comment have a chance to see some goals of Gerd Mueller enjoy it- you will never see a man scoring just because of a football is somewhere near his legs and he standing somewhere near to the goal. This alluding to La Liga being 'non-competivive', a 'league with only 2 horses' is becoming rather boring. Like a guitar with broken strings. Let's see...the current World Champions are Spain. The current European Champions are Spain. The best two club teams in soccer are Spanish (Barca and R Madrid). Last season, the two finalists at the Europa League were, you got it right, spanish (and not the proverbial two strong teams, rather, 'weaker teams, Atletico Madrid and Athletics Bilbao, who by the way, effortlessly blew past apparent stronger European teams like Manchester United, ManCity, Liverpool, etc). Currently, out of the last 16 in the Champions League, 4 teams are, yes yes, Spanish. Soccer leagues around the world are currently dominated by Spanish players. The current record for most goals scored in a season is Spanish. The current record holder for most goals scored in a single champions league match plays in, you got that right once again, Spain. The current record for most goals scored in a single calendar year goes to a Spanish player. The current Fifa coach of the year, now retired, won his accolade in Spain. Let's face it, times have evolved. While the Bundesliga was a force to reckon with in soccer a decade or two ago, the EPL stole that title from them. Unfortunately, Spain and La Liga have evolved and taken the spot light off the EPL. Currently, the best soccer is being played in Spain. Period. which player is the best of the 3rd millennium ? let's vote. cnn and its boring topics of best of this or best of that. if this dumbdown mentality only happened in sports that wouldn't be too bad. mbmehdi, you are in complete denial. I guess 3 Ballon d'ors and possibly a 4th is just a coincidence? You are right, it is a completely different game now, one in which the overall skill level is much better all around. Just because defenders don't try to break forwards legs doesn't mean all players goals are meaningless. Winning a World Cup means the whole team has to preform, not just one player, and these days, the Champion's League is much more impressive. Why don't you just sit back and enjoy a player who is breaking every record in the books and still has the majority of his career left? I know I feel blessed to be able to live now and watch him, and frankly, I feel sorry for people like you. Messi is and will remain the best player ever. KevinT, you are a smart man sir. I'm so sick and tired of all the EPL fans acting as if their league is miles ahead of everyone else. It's not just a two horse race in La Liga anymore, Malaga and Atletico are making sure of that. you scoffed at Messi's achievement based on his international performance...banking also on his earlier years in international competitions..foolish..Argentina during that period was individualistic and it was Sabella who gave Messi the respect he garnered from his team mates and the Argentinians..
Zico from Flamengo, and Brazilian National team, scored one more than Messi and it is well documented... Why it does not show up there? Messi plays mesmerizing football and is a marvel to watch. However, some records in Zambia show that Godfrey Chitalu scored 107 goals in a calender year (1972) The media would do well to highlight this. What about Zico and other undocumented players in their respective Super leagues. For club Messi has been outstanding. On that front Leo does not have to prove anything to anyone. But for country his best is yet to come. He needs to score goals for Argentina in the coming two World Cups, goals that will mark him out as the greatest footballer of all time. Let's hope Messi and his Argentine colleagues do well in the forthcoming World Cup in neighboring Brazil. Messi is a great and wonderful footballer. But, he is not the best and greatest football prayer...until he wins the FIFA World Cup with the Argentina national team. Both are different, wickedly talented and well adapted to the game in the times that they play(ed). They realize that their success is due to their supporting cast as well. As well as being understated, these are the most important things. And I'm sure Messi's having the time of his life dancing around almost everyone he plays against anway. Congrats Leo, it's quite an accompishment, to say the least. It is fair to talk about the most prolific goal-scorer . May be of his time or may be of all time. A tree cannot a foreat make . The prolific goal scorer is able to get the goals only because the other ten players in the team do what they do best. I have seen many a prolific goal scorer dwindle when he failed to get adequate service from his team mates. I have even seen some go into oblivion and out of the game completely. Those who do the background work and those who create the openings need fair mention too. we should stop weeping sentiment when it comes to talent.i was made to ask about players b4 our generation.pele and others and i understood that pele and co does not possess half of what messi has.they are more of a waiting players but very clinical in finishing.maradona whit all his mesmerising moves came out to say that messi is the greatest of them all.i wonder why pele is still holding forth.if messi where to come from europe the whole world would have accepted the fact by now.give honor to whom honor is due. Messi makes me cry, I have never seen such beautiful football in my life, And I've seen Pele, Maradona, Cruyff, Boccini, Veron, Zidane, Figo, Ronaldo and a few more over my life and they were excellent, ahead of their time, I really don't know. All i know is that Messi makes me cry along with the rest of the team. Messi is a genius that likes to play football so much and I am so happy to be alive so that I can see this beautiful football happening for me to see and love. I like to think that Lio Messi is not a football player, I think of him as an artist someone who likes to make paintings of his plays and goals. It's better to not think of him as a football player. Because if that's the case then tell me what are the other guys in the pitch doing? messi go on you are still to show the world that you are the best of all the time!! Messi is the only player i love watching him play. He is indeed the world best player and will continue to be untill he retires to play football. Messi is the greatest in terms of soccer, he is a football genius. Messi is great but NOT as great as Mueller. 25 of Messi's goals were penalty shots where Gerd Mueller had ZERO! HIS goals were hard fought and earned, not given on a plate. Sorry, but facts are facts. Messi is wonderful, absolutely, but second to Mueller. *and if I hear Maradona's name again I'll puke: he is a cheater and a vulgar conceited CRAZY egomaniac... and a horrid coach. He is a disgrace to soccer and always will be. Listen, y'all, my boy is a good player. But I have been telling him that unless he wins a worldcup and a European or South American cup, he just can't compare to Gerd Mueller. He just seems to freeze up everytime there's a big contest. I just don't know what else to tell him. He can't get them goals that he should. So he'll have to wait a bit until he matches greats like Mueller, Breitner and others.